Franchises rise and fall as the years go on. With Transformers in a bit of a slump in various departments (with the exception of some of the comics), my attention turned back to another giant robot series from long ago. I was a big fan of Gundam Wing back in the early 2000s. My return to Gundam coincides with the debut of the fantastic Iron-Blooded Orphans anime and news of several other animated projects. One of these is an adaptation of several chapters of the highly-regarded Mobile Suit Gundam: The Origin manga. Over the past few years, the entire series has been published in hardcover form, a rare publishing style known as an "Aizouban" that is closer to American comic book sentiments. I've decided to skip ahead to the second volume of Origin. Each volume of the hardcovers covers about five or six episodes along with new material, all designed to be the ultimate adaptation of the original anime. The first few episodes of the series featured a lot of exposition and character introduction that never quite impressed me. The title of this volume, "Garma," refers to the the charismatic youngest son of the leader of the Principality of Zeon, the space colony empire that has conquered Earth. Garma Zabi's quarry is the ship called White Base, which evacuated from a colony under invasion while carrying numerous refugees and several giant robots called "mobile suits." This volume of Origin has important moments for the two leading men of the franchise. On the side of the Earth Federation is young Amuro Ray, who ended up in the cockpit of the titular RX-78-2 Gundam mostly by accident and is not thrilled to be piloting it. One of the themes in almost every Gundam series is the interplay between the desire for peace and the necessity of war. Amuro despises the war and fighting in general; we find out more about his attitude when he visits his mother in a refugee camp on Earth. It takes him some time to finally come to terms with using the Gundam to restore peace, and part of this comes in the form of one of the most famous moments in the series: the "Bright slap." Captain Bright Noa, the young commanding officer of the White Base, has to smack Amuro across the face several times to get him to return to his piloting duties. It's disconcerting, but a later scene of physical abuse between a father and daughter clarifies that Bright's actions were desperate and not necessarily correct. I should probably mention the names -- another unifying factor in the Gundam meta-series is the very weird character naming. Some have normal names like Kai Shiden; some have seemingly inverted names like Job John; some have "space names" like Garma Zabi that are exotic on purpose. And then you have Amuro's childhood crush, Fraw Bow, a name I can't make heads or tails of since her first name is a German honorific. Names play an important role in the legend of the other lead character, Zeon ace pilot Char Aznable. This alias is one of close to a half-dozen names he takes throughout various series to cover up his true identity. "Garma" only hints at the truth behind the helmet and sunglasses near the end, when Char's treachery comes to the fore. In a way, he's the franchise's Starscream, but with a better motive involving being the son of Zeon's founder who had his kingdom stolen from him by the Zabis. He's more than a match for Amuro in the piloting department and only the Gundam's advanced technology gives the Federation any edge over him. As the White Base makes its way to the Federation headquarters at Jaburo in South America, Char becomes the perpetual second in command to Zabi-affiliated leaders who keep suspiciously dying. Retellings of classic anime are similar to reboots of popular comics: unless they're done right, a lot of anger builds up within the fan base. However, Origin has two advantages that have generated a hugely positive reception. Firstly, there has never been a "true" version of the original anime that stuck. 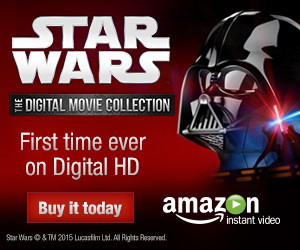 It was cut short in its original run and was then edited into several movies. Origin adds much to the story and rarely takes anything away. Secondly, the series is written and drawn by Yoshikazu Yasuhiko, the character designer from the original anime. As a result, the art "looks" correct since it's coming right from the source. Yasuhiko did not design the now-iconic mobile suits but he renders them in his own sharp style. There are a couple of major changes, such as adding to the armament of the Gundam by replacing one beam saber with what I'm fairly sure is a plasmacaster from Predator. The squat Guntank has received a total redesign for realism. The most impressive work comes in making the fairly ridiculous Zeon vehicle designs look intimidating. One thing I noticed is the relatively few mobile suit battles that take place throughout the book. They're mixed in with a hostage crisis, a desert car chase, and political intrigue involving the mayor of Los Angeles and his beautiful daughter. Recently, Iron-Blooded Orphans has had several episodes with no mobile suit fights, so it's interesting to know that this is a trend that stretches all the way back to the start of the franchise. 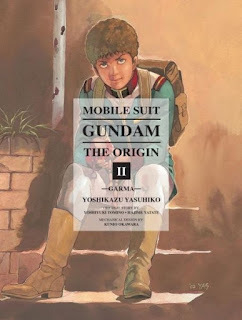 One final incentive for American readers to try Mobile Suit Gundam: The Origin Volume 2 is the fact that it takes place in the United States of the not-so-distant future. Available at all Barnes and Noble stores and many comic book stores, it's worth your while to read at least one volume of Origin. Don't blame me if you feel like building a model kit shortly thereafter.